Sorcerers Hat salt mill made from crystal clear acrylic with a brushed stainless steel base, has an easy filling direct through mechanism and is 20cm high (8 inches). 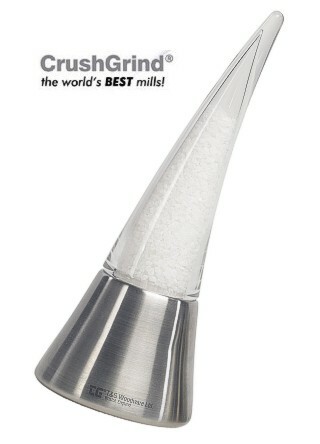 T&G's Crushgrind ® is like no other mill, its unique ceramic mechanism allows you to effortlessly grind not only salt and pepper but also, using the same grinder, enjoy the vastly superior aroma and taste that only the milling of whole dried herbs and spices can provide. Price is for salt mill only. Arrives pre-filled with seal salt crystals.